On the 8th of November at 2.30pm, five well-known networking groups are coming together at the Kempinski’s new steakhouse and brasserie Baltazár Bar & Grill for a lunchtime networking session. 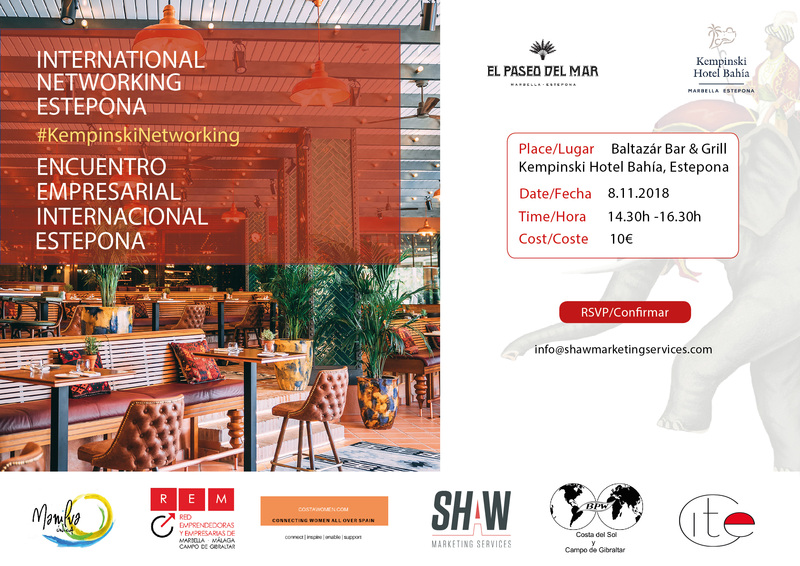 CITE Estepona, Shaw Marketing Services, Costa Women, Red Emprendedoras Marbella and BNI Global Estepona have all decided to collaborate on this event to allow their members and the local business community to meet, share ideas and grow their business. They are also supported by Manilva Town Hall’s Commerce Department, to help build better relationships between businesses in Manilva, Estepona and Marbella. The Kempinski Hotel Bahía is hosting this great event in their beautiful new steak restaurant and brasserie Baltazár Bar & Grill. During the lunch they will be presenting their Christmas Business Menus for 2018 and guests will be able to sample aspects of these menus while they network. Bringing together some of the area’s best networking organizations, this bilingual event will be the perfect business environment to make new contacts and inspire you for the final push towards Christmas. It costs 10€ per person, which includes relaxed networking, drinks and a chance to try dishes from the new Christmas Party Menus at the Kempinski. Numbers are limited and reservations are essential. Please email info@shawmarketingservices.com to book your place.